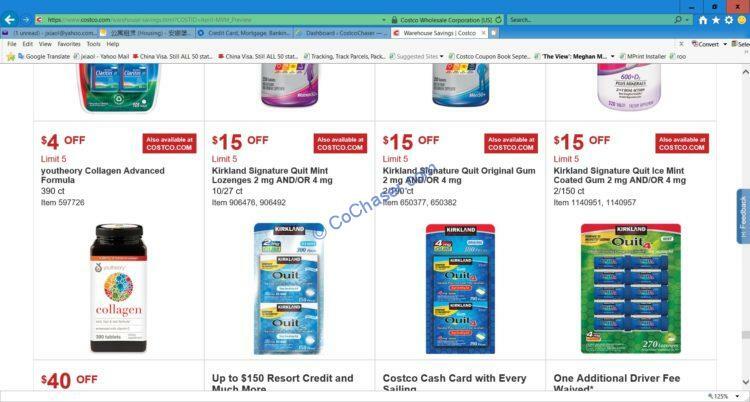 Costco April’s coupon book in 2019 is out now, deals valid from Wednesday 04/17/19 – Sunday 05/12/19. This Costco coupon book is for member-only savings that shows you the latest products and deals that you can earn instant savings when you shop at Costco with these coupons. One of the top April’s discounts on coupon book is Samsung 55″ Class 4K UHD LED LCD TV that your cost is $879.99. HP Pavilion 23.8″ 1080p Touchscreen All-in-One is on sale, taking $200 off, the final price is $699.99. HP Pavilion 15.6″ Touchscreen Laptop is $70 off, bringing the price down to $499.99. HP Officejet Pro 6958 All-in-One Color Inkjet Printer has $60 off, the price is down to $59.99. Kohler Malleco Touchless Pull-down Kitchen Faucet with Soap Dispenser has $50 off, dropping the price to $149.99. Vitamix Explorian Series Blender gets $70 off, the final price is $279.99. KitchenAid Professional Series Bowl Lift Stand Mixer has $80 off, the final price is $249.99. Snapware Pyrex 18PC Glass Food Storage Set gets $7 off, binging the price down to $22.99. Samsonite 2-Piece Softside Luggage Set has $30 off, the price is $119.99. Philips Sonicare ExpertResults 7000 Electric Toothbrush has $40 off, bringing the price down to $109.99. The tire coupon is for Michelin. Naked Juice Variety Pack 12-count, 10-ounce. Sconza Lemoncello Chocolate Almonds, 24 oz.